To celebrate Holi, the Indian festival of colour, check out this colourful radar image! The bright rainbows are areas of dynamic changes, while dull greys are stable and steady. The European Space Agency (ESA) Envisat satellite took radar images of the Earth. In this composite, each colour from a different orbital pass to highlight changes in the planet below. 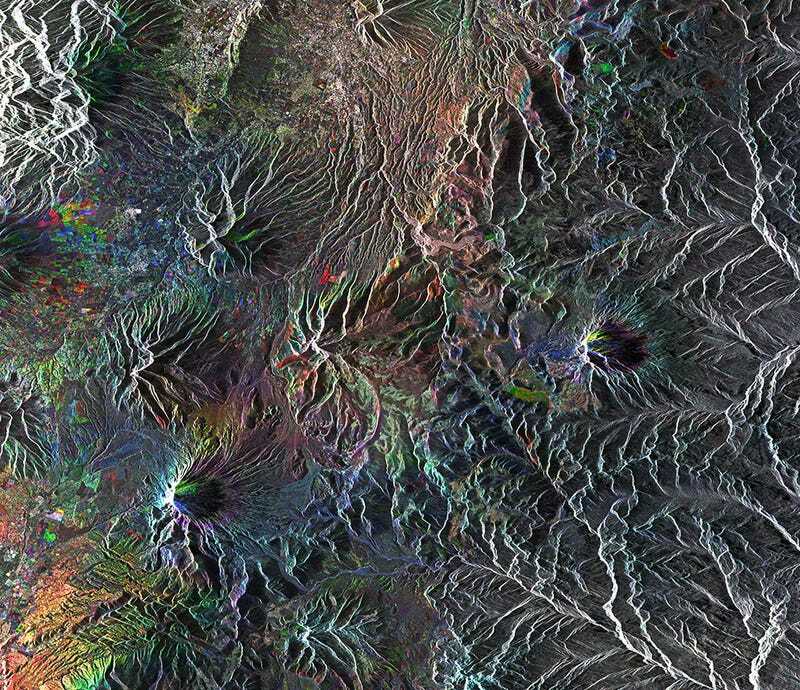 Ecuador's northern highlands were imaged in three passes on 4 June 2006, 20 January 2008 and 24 January 2010. The white dots in the top left are Ecudor's capital city, Quito, while the remainder of the area has scattered volcanoes from the Andean Volcanic Belt. The white peaks aren't glaciers, but echoes from nearly perfectly vertical reflections of the radar signal. The patchwork squares of rainbow blocks are evidence of agriculture, where work in the field from tilling, sowing, growing, harvesting, and changing plot boundaries all produce decidedly different radar signatures. The less regular rainbows draping along volcano flanks are more sinister: evidence of ground motion, creep, slumps, and landslides. To the bottom left of the image, Cotopaxi stratovolcano summits at 5900 m in a halo of rainbow instability. Cotopaxi is one of the most active volcanoes in the country, with more than 50 eruptions since the 1700s. The most recent eruption was in the 1940s, but monitoring is ongoing. The Envisat mission ended abruptly in 2012 when ESA lost contact with the satellite. After prying for more information out of the spacecraft, the most likely scenario is that the power regulator failed, blocking all telemetry and telecommands. The other plausible option is that a short circuit sent it into safe mode, and the satellite cannot be woken up.